Occasionally I get requests for fingerboards with unusual scales. Most recently a 27" scale. 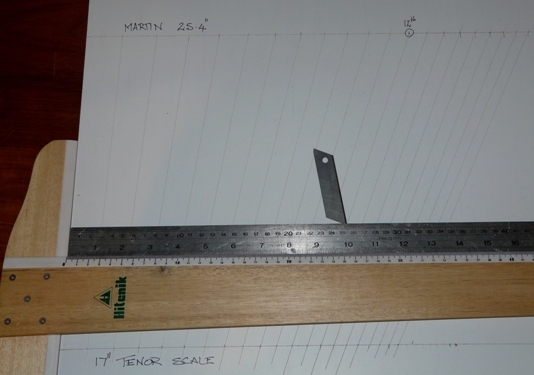 As I use the LMI templates with my power saw I needed a simple way to redraw all the fret positions with a new scale length. So after pondering the puzzle for a while it occurred to me that if I align two existing scales that I already have or alternatively transfer two scales from known instruments that are correct I can come up with the third if I follow a couple of rules. 1. By placing both scales at the same start point on a line at 90 degrees/ square to the vertical start line at a nominal distance apart you can draw lines between each fret number 1.e. 1..... to 22 etc. 2. 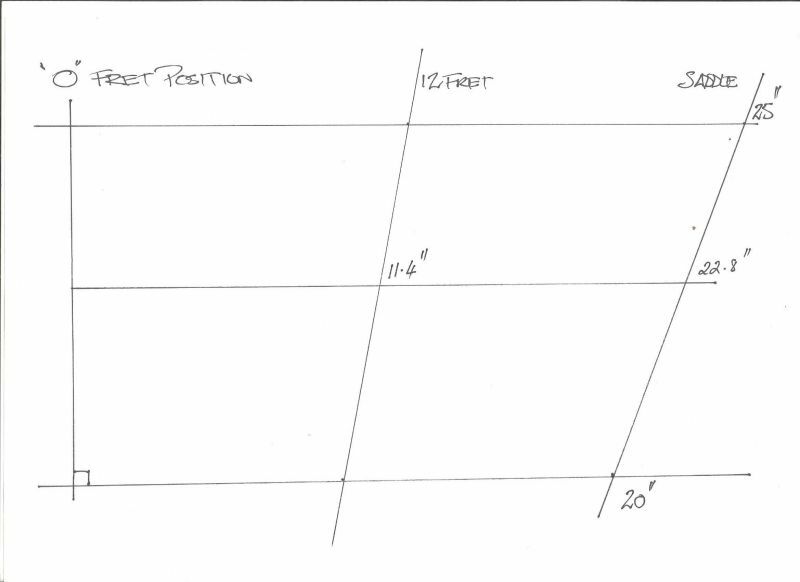 As the proportions for all common scales are the same (within the constraints of guitar making) the angled lines for each fret will provide an exact intersection point when you draw another horizontal line through these fret lines. 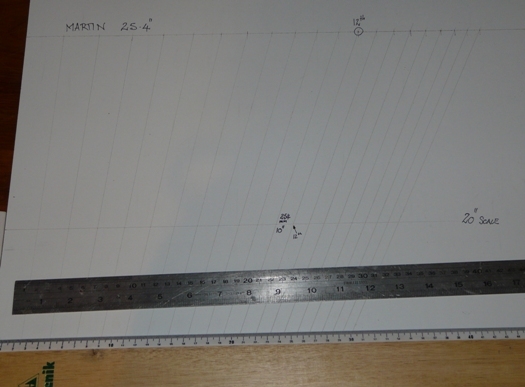 In the example below there is a 25" and 20 " line drawn with a 12fret position marked in the centre. If you draw a horizontal line across it at any point the angled line will always intersect at the centre point. 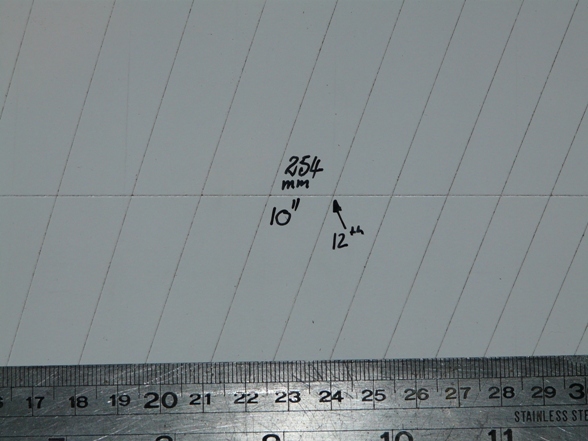 In the second drawing I have drawn a line which turned out to be 22.8" and the centre position read is 11.4"
The implications of this are that you can with a sharp pencil, square and/or T square draw new scales if you can accurately create the angled lines. There are flaws to this technique, namely impatience and inaccuracy, however with careful marking out you can create new scale length templates without doing any mathematical computations. I will include a practical demonstration time permitting. That's a good one Tim. Looking forward to the demo. The Stew-Mac fret calculator does it for me without too much hassle.Usew any scale length you like.Part of their "Free Information" pages on the website at http://www.stewmac.com/freeinfo.html . The most accurate way to lay out your scale is making all measurements from the nut (using the "fret to fret" distance only to confirm your layout). 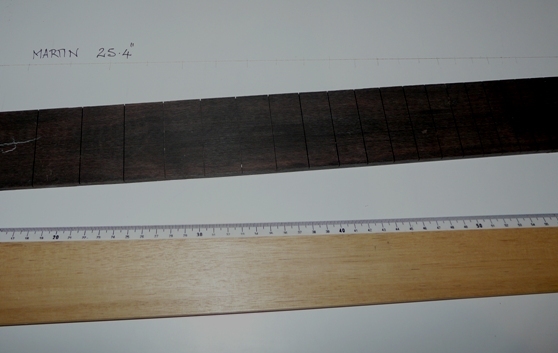 Laying out frets only by measuring fret to fret will compound error. For example, if you're laying out frets by marking with a scribe and your accuracy is plus or minus 2 millimeters, you could be off by as much as 24 millimeters at the 12th fret. 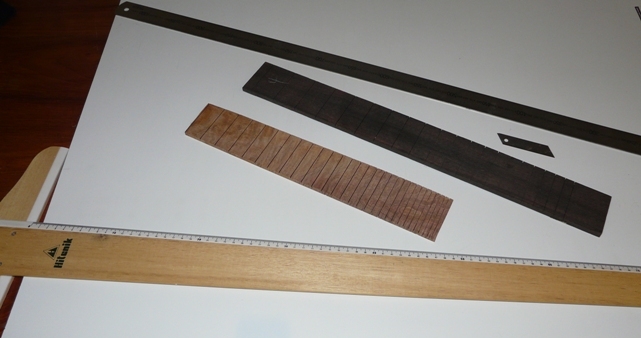 Measurements are given from the end of the fingerboard (face of the nut) to the center of a fret slot. Please note that these measurements are based on a mathmatical formula for compensation as well as an average of what "plays in tune" for a variety of instruments. Variables such as string height (action) and string gauge can affect the intonation of an instrument, so you may need to slightly adjust the locations given. Measurements are from the nut to the "break-point" of the string at the peak of the saddle. I use Wfret to print a template for me. Because printers are not absolutely accurate you need to check the distance to the 12th fret and modify the input scale length slightly till you get your target 12th fret distance. Stick the template on the board with gluestick. pierce with an awl to mark the slot positions and peel off. Use chalk to show up the marks on ebony. I tried that a couple of times Jeff, and either the humidity up here, or my printer plays havoc with the scale length. Paper ends up nothing like the length that I wanted. So I've used Stew Macs fret calculator for those scale lengths that I don't already have a template for. 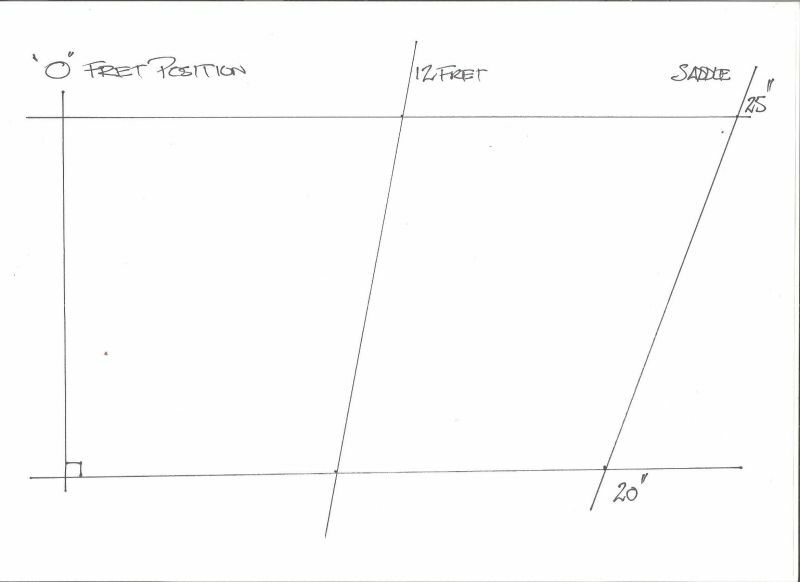 With Tim's method, there is merit, but I think that the best way would be to have the two scale lengths spaced far enough apart on the paper to allow a longer straight edge to span between them. Say a 12 to 18 inches. If they are close together then small deviations when your drawing the line between the marks are going to end up being big discrepancies. Is this the way a fan fret instrument is laid out? I have the marks tranferred to the fretboard within 5 minutes of printing to avoid humidity movement. Oh, my head hurts when I have to calculate things like that. Interesting calculation method, and may come in handy when there is some exact number you just have to hit. On the other hand, in an attempt to simplify this as much as possible, and to utilize the LMII fret template system for accuracy of fret slots, I would recommend that you first try to see if there is a fret spacing that can be achieved using one of the scales that LMII produces. For baritone scales, LMII sells a 27.5" template, but if your customer really wants something very very close to 27", then I would tell him/her that you can provide a 26.986" scale (that is off of their desired scale by .014" (less than 1/64"), and 99% of players would say that is just fine.) 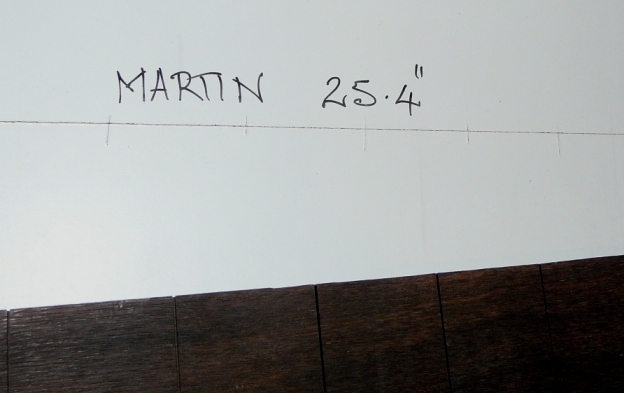 For that 26.986" scale length, buy an LMII 34" bass template, and start from the 4th fret. That's just one example, and if you start from their bass templates (35", 34", 32", 30"), and their baritone template (27.5"), and use the StewMac fret calculator or other fret position calculator that you trust, then you have quite a wide variety of accurate alternate scales to choose from - without having to make any real calculations or make a new template or attempt to shorten an existing template's scale length by rotating it. So, starting on the second or third fret doesn't effect the spacing of the frets? Just makes a shorter scale length as long as you put the bridge in the appropriate spot? Allen wrote: So, starting on the second or third fret doesn't effect the spacing of the frets? Just makes a shorter scale length as long as you put the bridge in the appropriate spot? In my example to Tim above, the 26.986" scale length is the result of simply subtracting: 34" - 7.014"
Well there seems to have been a bit of discussion with some proffering some other alternatives. I guess that is the beauty of the forum! In a nut nut shell I was only offering one approach that might be of use in the absence of calculators etc. Of course this approach does require two existing scale length references to work with. I have attached some images which should be self evident. The notion of " the most accurate way" dependent upon what you are using as your reference and of course the final application. If the reference is an industry standard like the LMI templates then you shouldn't have too much trouble. 1. With the pictured equipment you can draw two horizontal lines as far apart as possible. I concur with Allen on this point. 2. Mark out the existing slot positions using a blade fitted into the slot. If the blade is thinner than the slot I would suggest to work against one side of the slot to minimise any error. 3. 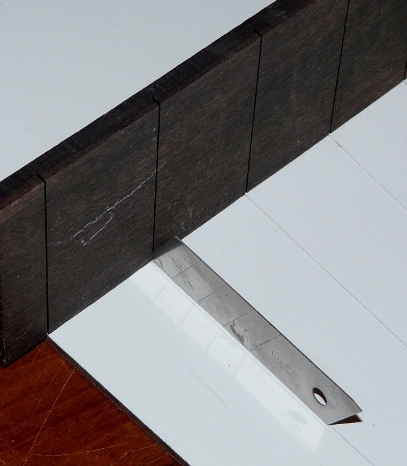 Once you have marked out both scale length slot positions, simply and carefully with the blade join up the matching slot from either fingerboard. 4. Finally establish the correct position which in this case is a Baritone 20" scale by finding the 12fret positon which is 10" or 254mm. 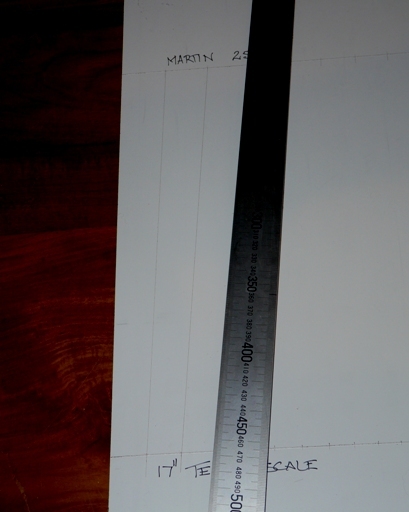 Once the ruler is lined up scribe a horizontal line across and you now have a 20" scale with all the fret slot positions marked. Reasonably simple and elegant Tim. This entire post will no doubt be of benefit to people down the track, no matter what method they choose. Very clever feline fleecing Tim, this is a great way to establish any scale length you want. "I have not failed 700 times. I have not failed once. I have succeeded in proving that those 700 ways will not work. Last edited by simso on Sun Sep 07, 2014 2:12 pm, edited 1 time in total. Most kind Steve it will be a handy tool for sure and I'm more than happy to cover material and postage cost. PM me if you need my address details again.